Great tasting milk chocolate fudge in a holiday tin. This fudge makes a perfect stocking stuffer. 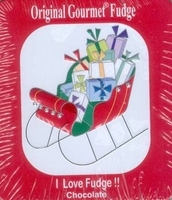 Not only does this fudge come in a cute Christmas tin, but it also says I love fudge right on it. The picture on the tin will vary, as we have a few different styles.